Aug. 21 (Bloomberg) --Crude oil rose to a 10-month high in New York, following equities higher on speculation that the global recession is easing. Oil climbed 1.3 percent as the Standard & Poor’s 500 Index advanced to the highest level since October, after U.S. existing home sales increased more than forecast. Prices were also bolstered as the euro strengthened against the dollar, enhancing the appeal of commodities to investors. Crude oil for October delivery increased 98 cents to $73.89 a barrel at 2:50 p.m. on the New York Mercantile Exchange, the highest settlement since Oct. 20. October futures advanced 6.2 percent this week. Prices are up 66 percent this year. Brent crude oil for October settlement rose 86 cents, or 1.2 percent, to end the session at $74.19 a barrel on the London-based ICE Futures Europe exchange. Purchases of existing homes climbed 7.2 percent to a 5.24 million annual rate, the most since August 2007, the National Association of Realtors said today in Washington. The gain was the biggest since records began in 1999. The S&P 500 added 1.7 percent to 1,024.82 at 3:11 p.m. in New York and the Dow Jones Industrial Average gained 1.5 percent to 9,493.19. European stocks advanced after services in Germany and manufacturing in France unexpectedly rose. An index of the German services industry rose to 54.1 this month from 48.1 in July, Markit Economics said today, citing its purchasing managers’ survey. The French manufacturing index increased to 50.2 in August from 48.1 in the prior month. A reading above 50 indicates growth. Economists forecast both indexes would remain below 50, a Bloomberg News survey showed. The U.S. currency declined 0.6 percent versus the euro to $1.4343 from $1.4254 yesterday. The Dollar Index, which tracks the dollar against currencies including the yen, pound and Swedish krona, fell 0.5 percent to 78.027. The U.S. Energy Department reported on Aug. 19 that crude- oil inventories fell 8.4 million barrels to 343.6 million last week. The decline left stockpiles 15 percent higher than the department’s revised figures for the year-ago period. U.S. fuel demand climbed 3.1 percent to 19.3 million barrels a day last week, the department’s report showed. Consumption has increased in six of the past eight weeks. “We are staring to see pretty good product demand, which is supporting prices,” Mueller said. South Korea, the world’s ninth-biggest consumer of crude oil, said fuel demand rose for a fourth month in July as the economy showed signs of recovery. The country used 63.66 million barrels of oil products last month, up 5.2 percent from 60.51 million barrels a year earlier, data e-mailed today by state-run Korea National Oil Corp. shows. U.S. supplies of distillate fuel, a category that includes heating oil and diesel, declined 650,000 barrels to 161.6 million last week. The drop left stockpiles 23 percent above the revised figures for the same period last year. Futures may fall next week, according to a weekly Bloomberg News survey. Twenty-one of 38 analysts surveyed, or 55 percent, said futures will decline through Aug. 28. Eight respondents, or 21 percent, forecast that the market will rise and nine said prices will be little changed. Oil volume in electronic trading on the Nymex was 387,705 contracts as of 3:14 p.m. in New York. Volume totaled 468,752 contracts yesterday, 13 percent lower than the average over the past three months. Open interest was 1.14 million contracts. The exchange has a one-business-day delay in reporting open interest and full volume data. Aug. 22 (Bloomberg) -- The dollar and yen fell against the majority of their most-traded counterparts as U.S. housing and manufacturing reports signaled that the economy is recovering from recession, easing demand for the currencies as a refuge. The euro also rose on the week against the dollar and yen as German services and French manufacturing unexpectedly expanded in August. The Norwegian krone climbed to the strongest level against the euro since March after a report showed the world’s fifth-largest oil exporter emerged from a recession. The greenback slumped 0.9 percent to $1.4326 per euro yesterday from $1.4203 on Aug. 14, while also dropping more than 1 percent against the South African rand, Swedish krona, Canadian dollar and Swiss franc. The yen fell 0.3 percent to 135.21 per euro, from 134.84 last week. Japan’s currency also declined versus the rand, krona and franc. The dollar fell 0.6 percent this week to 94.38 yen. The Standard & Poor’s 500 Index gained 2.2 percent on the week, touching a 10-month high yesterday. Europe’s Dow Jones Stoxx 600 Index advanced 2.7 percent. An index of the German services industry rose to 54.1 this month from 48.1 in July, Markit Economics said yesterday. The French manufacturing index increased to 50.2 in August from 48.1 the prior month. A reading above 50 indicates expansion. Economists forecast both indexes would remain below 50, according to a Bloomberg News survey. The global economy is “beginning to emerge” from a recession after aggressive action by central banks and governments, Federal Reserve Chairman Ben S. Bernanke said yesterday at a symposium in Jackson Hole, Wyoming. Sales of existing U.S. homes climbed 7.2 percent to a 5.24 million annual rate, the most since August 2007, according to the National Association of Realtors yesterday. The gain was the biggest since records began in 1999. The Federal Reserve Bank of Philadelphia’s general economic index climbed to 4.2 from minus 7.5 in July, the bank said Aug. 20. Positive readings signal an expansion. The leading U.S. economic indicators rose in July for a fourth consecutive month, the Conference Board reported separately the same day. A damaging drop in the dollar, volatile financial markets and slower global growth may result as the Fed and other central banks show few signs of reprising the coordinated stance they took combating the financial crisis as they deal with its aftermath, according to Mohamed El-Erian, chief executive officer of Newport Beach, California-based Pacific Investment Management Co. The greenback is threatened as net debt will increase to 56 percent of U.S. gross domestic product, the billionaire investor Warren Buffett wrote in a New York Times commentary this week. The dollar as a percentage of global central banks’ foreign reserves increased to 65 percent in the first three months of the year, from 64.1 percent in the previous quarter, according to the International Monetary Fund. Its share has remained around 65 percent the last five years, after falling from 72.7 percent in 2001. The Dollar Index, which IntercontinentalExchange Inc. uses to track the U.S. currency against the yen, euro, Swiss franc, British pound, Swedish krona and Canadian dollar, dropped for a second week, falling 1.1 percent to 78.04. “There is a need for a global reserve system,” Stiglitz, a Columbia University economics professor, said at a conference in Bangkok yesterday. Support from countries like China should ensure orderly discussions on a new reserve system, he added. Orders for U.S. durable goods, excluding automobiles and aircraft, will rise by 3 percent in July, according to the median forecast of 40 economists in a Bloomberg News survey. This would signal an expansion of manufacturing in the second half of the year. The Ifo institute in Munich will release its business climate survey, base on a survey of 7,000 executives, on Aug. 26. German business confidence will rise for a fifth month in August, according to the median of 41 forecasts in a Bloomberg News survey. “The German Ifo survey is the next big market mover,” said Bilal Hafeez, the London-based global head of currency strategy at Deutsche Bank AG, the world’s biggest foreign-exchange trader. Aug. 21 (Bloomberg) -- Crude oil traded near $73 a barrel in New York, poised for a weekly gain on optimism the prospects for a global economic recovery have improved. Oil prices were supported by a third day of gains by U.S. equities as American International Group Inc. said it expects to repay the government and data on manufacturing and economic indicators added to evidence the recession may be ending. Oil stockpiles dropped 8.4 million barrels last week, the most since May 2008, the Energy Department reported Aug. 19. Crude oil for October delivery traded at $73.11 a barrel, up 20 cents, on the New York Mercantile Exchange at 9:29 a.m. Sydney time. Futures are up 6 percent this week. The September contract expired yesterday. The Standard & Poor’s 500 Index rose 1.1 percent in New York and the Dow Jones Industrial Average jumped 70.89 points to 9,350.05. The dollar traded at $1.4257 per euro at 6:06 a.m. in Tokyo, after declining 0.2 percent yesterday in its third drop. U.S. crude inventories dropped to 343.6 million barrels and gasoline supplies declined 2.18 million barrels, the Energy Department report showed. Brent crude oil for October settlement fell $1.26, or 1.7 percent, to $73.33 a barrel on the London-based ICE Futures Europe exchange yesterday. FKLI Aug Futures contract rebound 10.5 points rebound to close at 1161.5 levels as compare to previous trading session to with a total of 5,507 lots traded in the market. FKLI rebound during trading session as regional indices recovered strong after previous sharp fall. Technically, FKLI topped again at 1166 levels and manage to break down from lower trend line around 1163 levels. Based on our technical analyst, our opinions suggestion FKLI still uncertain would continue to rebound in the coming trading session but likely trade lower provided resistance levels at 1169 and 1174 were not violated. However, traders were still advice to hold short position in the coming trading session while be cautious around support levels at 1157 and 1147 regions. CPO 3rd month Oct futures contract close marginal RM2 higher as compare to previous trading sessions to close at RM2301 with a total of 14,644 lots traded in the market. Wild trading days for CPO price trading as crude oil and soybean oil electronic trading plunge despite were closed firm during overnight trading. Technically, CPO price manage to rebound 78.6% Fibonacci rebound level at RM2350 regions and manage to break down from lower trend line around RM2340 levels. Based on our technical analyst, our opinion suggests CPO price would trade lower heading support levels at RM2372 and RM2342 regions. Traders were advice to hold short position in the coming trading session provided resistance levels at RM2330 and RM2350 were not violated. Aug. 20 (Bloomberg) -- Palm oil futures rallied on concern among analysts that supplies from Indonesia and Malaysia, the largest producers, will fall short of expectations. Unless there is an improvement in oil-palm yields, which are typically larger in the second half, a period of lower than expected production may coincide with rising demand as the global economy recovers, analysts said. November-delivery palm oil rose as much as 2.2 percent to 2,349 ringgit ($665) a metric ton on the Malaysia Derivatives Exchange and traded at 2,345 ringgit at 11:31 a.m. local time. Prices have gained 7.1 percent this month and 38 percent this year amid speculation an economic recovery will sustain demand even if oil palm production climbs to a record, as the governments of Indonesia and Malaysia have forecast. The outlook for palm oil also improved after about one- quarter of soybean crops in Argentina, the biggest exporter of soybean oil was destroyed by drought. Soybean oil is the second most-consumed edible oil. ECM Libra today reiterated its “overweight” view on plantation stocks based on the outlook for palm oil prices, echoing a separate report from CLSA Group this week that cited “China and India’s great hunger” to feed the world’s most populous countries. Palm oil is the world’s cheapest edible oil. Vegetable oil imports by India may climb to a record as the lowest rainfall in five years threatens to damage oilseed crops and worsen a shortage, a processors’ group said on Aug. 13. Purchases in the year ending Oct. 31 may jump 27 percent to 8 million tons, the Solvent Extractors’ Association of India said. Koh Miang Chuen and Conrad Werner, analysts at Morgan Stanley Asia (Singapore) Pte., this week said palm oil prices may average $700 a ton in the second half, compared with $612 a ton in the first half, aided by demand during the holy Muslim month of Ramadan, which starts in August. Both Indonesia and Malaysia, which account for 90 percent of world palm oil output, are predominantly Muslim, and expanding domestic demand during Ramadan would crimp supplies for export. Malaysian palm oil output climbed 3 percent in July, the slowest pace in three months, to 1.49 million tons, while exports gained 13 percent, the country’s palm oil board said. So-called tree stress, which cuts yields, had curbed output in Malaysia, the second-largest producer, and Indonesia after last year’s record output and wet weather in the early part of the year. Aug. 19 (Bloomberg) -- OPEC should agree to maintain oil production targets when it meets next month to decide quotas, Kuwait’s oil minister said. Oil prices are “not too bad, not too bad at all,” Sheikh Ahmed al-Abdullah al-Sabah told reporters in Kuwait today. OPEC should keep quotas unchanged, he said. Al-Sabah favors an oil price of $70-$80 a barrel. Crude oil for September delivery fell as much as 50 cents, or 0.7 percent, to $68.69 a barrel on the New York Mercantile Exchange and traded at $68.89 as of 8:40 a.m. in London. Prices have rebounded 55 percent this year. Members of the Organization of Petroleum Exporting Countries agreed in December on record production cuts of 4.2 million barrels a day in an attempt to support oil prices that slumped 69 percent after reaching a record $147.27. The group is scheduled to discuss quotas in Vienna on Sept. 9 after leaving output unchanged at its last two meetings. OPEC raised production in July as compliance with quotas weakened for a fourth consecutive month, the group said in an Aug. 11 report. The 11 members bound by a production quota of 24.8 million barrels a day are producing 1.4 million barrels above their target, it said. Economists at Deutsche Bank AG said a cut is still possible as inventory levels keep rising. “Fears of a global depression have abated and the consensus for the ‘call on OPEC’ in 2010 suggests lower quotas may be required,” Adam Sieminski, chief energy economist at Deutsche Bank, said in an Aug. 14 report. Angola, Iran and Venezuela are the biggest quota-busters. Angola’s daily crude oil exports are scheduled to rise to the highest this year, according to shipping programs, and Iran and Venezuela are producing at least 200,000 barrels a day each above their formal limits, Bloomberg data shows. Al-Sabah said he’s optimistic that demand will increase by year end. Aug. 20 (Bloomberg) -- Crude oil traded little changed near $72 a barrel after a government report showed U.S. inventories declined the most in 15 months as imports tumbled and refineries increased operating rates. Oil surged as much as 5.2 percent yesterday after crude stockpiles dropped 8.4 million barrels last week, the most since the week ended May 23, 2008, an Energy Department report showed. Imports slipped 1.41 million barrels a day to 8.11 million, the biggest drop and lowest rate since September when hurricanes struck the Gulf of Mexico coast. Crude oil for September delivery traded at $72.48 a barrel, up 4 cents, on the New York Mercantile Exchange at 8:16 a.m. Singapore time. Yesterday, the contract climbed $3.23 to settle at $72.42. Prices are up 62 percent this year. The September contract expires today. The more-active October contract was at $73.87 a barrel, up 4 cents. U.S. crude inventories dropped to 343.6 million barrels and gasoline supplies declined 2.12 million barrels, the Energy Department report showed. Refineries operated at 84 percent of capacity last week, up 0.5 percentage point from the prior week, the department said. Oil also gained as the dollar declined against other currencies, increasing the appeal of commodities to investors looking for an inflation hedge. The dollar fell 0.7 percent versus the euro to $1.4231, from $1.4136 yesterday. Gasoline inventories dropped 2.18 million barrels to 209.8 million, the fourth-straight decline, according to the report. Supplies were 3.8 percent higher than revised numbers for a year earlier. Gasoline for September delivery was at $2.0410 a gallon, up 0.64 cent, in New York. The contract yesterday rose 3.44 cents, or 1.7 percent, to end the session at $2.0346 a gallon. Crude-oil supplies were forecast to increase 1.2 million barrels, according to the median of 13 analyst responses in a Bloomberg News survey. Gasoline stockpiles were forecast to decline 1 million barrels. Brent crude oil for October settlement was at $74.58 a barrel, down 1 cent, on the London-based ICE Futures Europe Exchange at 8:37 a.m. Singapore time. The contract rose $2.22, or 3.1 percent, to end yesterday’s session at $74.59 a barrel. Aug. 19 (Bloomberg) -- Soybeans fell to the lowest price this month as favorable weather boosts the crop in the U.S., the world’s biggest exporter of the oilseed. Wheat declined as global supplies may rise. In Nebraska, the fifth-biggest soybean-producer, participants in the Pro Farmer Midwest Crop Tour said pod counts from a sampling of plants in the eastern third of the state were up 9.1 percent from a year earlier. World wheat supplies will jump 8.3 percent, according to a U.S. Department of Agriculture forecast. Soybean futures for November delivery fell 1 cent, or 0.1 percent, to $9.58 a bushel on the Chicago Board of Trade. The price earlier touched $9.405, the lowest since July 30. The most-active contract lost 5.5 percent last week because of favorable U.S. weather. Wheat futures for December delivery declined 4.75 cents, or 1 percent, to $4.935 a bushel in Chicago, dropping for the third straight day. The price has plunged 8.7 percent since the end of June on speculation that increased global production will boost stockpiles. Global wheat production in the marketing year that ended on May 31 totaled a record 682.4 million metric tons (25.1 billion bushels), the U.S. Department of Agriculture said in a report last week. That will boost ending stockpiles in the current marketing year to 183.6 million tons, up from 169.5 million a year earlier, the USDA said. Soybeans are the second-biggest U.S. crop, valued at $27.4 billion in 2008, behind corn at $47.4 billion, government figures show. Wheat is fourth at $16.6 billion, behind hay. The U.S. is the biggest producer and exporter of soybeans and the world’s top shipper of wheat. Aug. 19 (Bloomberg) -- Gold rose as the dollar’s decline enhanced the allure of the precious metal as an alternative investment. Platinum also gained. Silver futures dropped to the lowest level this month. The dollar fell as much as 0.9 percent against the euro. Gold has mostly moved in tandem with the euro in every session since Aug. 5. The metal has declined 1.2 percent this month. In the second quarter, global gold demand dropped to a six-year low. Gold futures for December delivery gained $5.60, or 0.6 percent, to $944.80 an ounce on the Comex division of the New York Mercantile Exchange. Earlier, the price dropped as much as 0.6 percent. The metal has advanced 6.8 percent this year. Bullion for immediate delivery rose $3.06, or 0.3 percent, to $941.66 an ounce at 3:23 p.m. New York time. “Gold has taken the lead and seen some fresh investment interest,” Miguel Perez-Santalla, a Heraeus Precious Metals Management sales vice president in New York, said in an e-mail. Gold demand dropped 8.6 percent to 719.5 metric tons in the second quarter from a year earlier as the recession curbed buying by jewelers and electronics producers, the World Gold Council said today. Jewelry consumption declined 22 percent, while investment demand increased 46 percent. Central banks were net buyers in the quarter for the first time since at least 2000, council data showed. Platinum futures for October delivery gained $9.30, or 0.8 percent, to $1,241.40 an ounce on Nymex. The price has climbed 32 percent this year. Palladium futures for September delivery fell 55 cents, or 0.2 percent, to $271.80 an ounce. The metal has advanced 44 percent this year. Silver for December delivery fell 8.6 cents, or 0.6 percent, to $13.909 an ounce on the Comex. Earlier, the price touched $13.53, the lowest level since July 31. The metal has gained 23 percent this year. Aug. 20 (Bloomberg) -- The dollar traded near a one-week low against the euro on speculation economic data will add to signs the global recession is easing, prompting investors to seek higher-yielding assets. The dollar fell against 11 of its 16 major counterparts before a report forecast to show an index of U.S. economic indicators rose for a fourth consecutive month. The yen declined against all 16 major counterparts on expectations Europe’s manufacturing and service industries contracted at a slower pace. The pound traded near a one-week high against the dollar on economist estimates that U.K. retail sales gained in July for a second month, signaling the recession is easing. The dollar traded at $1.4254 per euro at 8:58 a.m. in Tokyo from $1.4224 in New York yesterday, when it fell 0.6 percent. Europe’s currency was at 134.13 yen after touching 132.20 yesterday, the lowest level since July 22. The yen was at 94.12 per dollar from 94.08. It gained 0.6 percent yesterday and touched the strongest level since July 23. The euro may advance to as high as $1.4320 by the end of this week, Dean said. Sterling was at $1.6557 from $1.6529. It’s near the highest level since Aug. 14 when it touched $1.6608. The Australian dollar gained versus the dollar for a third day to 83.04 U.S. cents from 82.87. Benchmark interest rates of 3 percent in Australia and 2.5 percent in New Zealand compares with as low as zero in the U.S. and 0.1 percent in Japan, making the South Pacific nations’ assets attractive to investors seeking higher returns. The Dollar Index, which tracks the greenback against the currencies of six major U.S. trading partners including the euro, yen and pound, was at 78.45 from 78.48 yesterday. The dollar fell against the euro for a third day as economists surveyed by Bloomberg News said the Conference Board’s gauge of the U.S. economic outlook for the next three to six months increased 0.7 percent last month after advancing at the same rate in June. The New York-based research group will report the data today. The composite index of manufacturing and service industries in Europe probably climbed to a year-high 48 this month from 47 in July, according to a separate survey. The index is based on a survey of purchasing managers by Markit Economics and a reading below 50 indicates a contraction. The data will be released tomorrow. U.K. retail sales gained 0.4 percent last month after rising 1.2 in June, according to a survey of economists. The Office for National Statistics is expected to release the data today in London. CPO 3rd month Oct futures contract plunge RM76 points lower as compare to previous trading sessions to close at RM2299 with a total of 20,092 lots traded in the market. CPO price plunge as crude oil and soybean oil electronic trading were traded weak due to news released regarding edible oil depend is sufficient by India. FKLI Aug Futures contract plunge 12.5 points lower to close at 1151 levels as compare to previous trading session to with a total of 7,330 lots traded in the market. FKLI plunge on 2nd trading session as regional indices lead by Shang Hai Indices and Hang Seng indices. 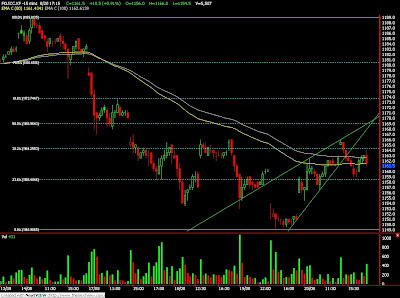 Technically, FKLI seems fails to penetrate resistance levels at 1166 during morning trading session but gap down and breach previous support levels at 1157 regions. Based on our technical view, our opinion suggests FKLI would encounter some buying interest as market temporary supported around 1144 – 1150 range. However, FKLI still seen riding on a bear rally. 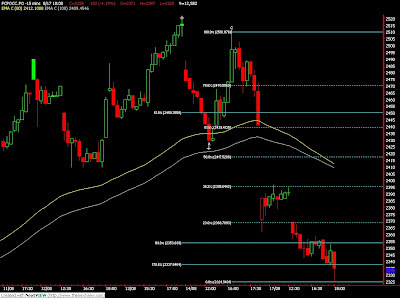 Therefore, traders were advice to hold short position around the resistance levels at 1164 and 1173.5 regions. Aug. 19 (Bloomberg) -- Oil rose for a second day as stocks climbed and an industry-funded report showed a decline in crude inventories in the U.S., the world’s biggest energy consumer. Oil surged as much as 5.3 percent yesterday as U.S. and European equities rose following better-than-estimated earnings at Home Depot Inc. and Target Corp. and an increase in German investor confidence. Prices extended gains in electronic trading after the American Petroleum Institute reported that stockpiles of crude declined by 6.13 million barrels last week. Crude oil for September delivery gained $1.06, or 1.5 percent, to $70.25 a barrel on the New York Mercantile Exchange at 8:19 a.m. Sydney time. Yesterday, it increased $2.44, or 3.7 percent, to settle at $69.19. The Standard & Poor’s 500 index rose to 989.67 and the Dow Jones Industrial Average rallied 0.9 percent to 9,217.94. The dollar traded at $1.4132 per euro at 6:02 a.m. in Tokyo, after falling 0.4 percent yesterday. U.S. crude inventories dropped to 342.4 million barrels and gasoline supplies declined 847,000 barrels to 212.6 million, the API report showed. The Energy Department is scheduled to release its weekly report today at 10:30 a.m. in Washington. Brent crude oil for October settlement rose $1.83, or 2.6 percent, to end yesterday’s session at $72.37 a barrel on London’s ICE Futures Europe Exchange. Aug. 19 (Bloomberg) -- The yen fell for a second day against the euro after economic reports in Europe added to evidence the global recession is easing, prompting investors to shift to higher-yielding assets. Asian stocks may climb after German investor confidence advanced to the highest level in more than three years. The pound increased yesterday from near a one-month low versus the dollar after a U.K. Office for National Statistics report showed the inflation rate unexpectedly held at 1.8 percent in July, exceeding the median forecast of 1.5 percent. Sterling was at $1.6569 from $1.6561 yesterday, when it rose 1.3 percent. The pound dropped to $1.6276 on Aug. 17, the lowest level since July 17. Yesterday’s advance helped sterling reduce its decline since Aug. 5 to 2.7 percent. The Standard & Poor’s 500 Index rose 1 percent in New York yesterday, crude oil for September delivery increased 4 percent to $69.45 a barrel, and gold futures for December delivery gained 0.4 percent to $939.40 per ounce. The benchmark MSCI Asia Pacific Index of regional shares ended little changed yesterday after falling as much as 1 percent. The euro strengthened yesterday for the first time in three days versus the dollar and yen as the Mannheim-based ZEW Center for European Economic Research said its index of investor and analyst expectations for Germany increased this month to 56.1 from 39.5 in July. The median forecast of 35 economists in a Bloomberg News survey was for the index to rise to 45. The Dollar Index, which IntercontinentalExchange Inc. uses to track the greenback against the currencies of six major U.S. trading partners including the euro and yen, fell 0.4 percent to 78.98. FKLI Aug Futures contract rebound 3.5 points higher to close at 1163.5 levels as compare to previous trading session to with a total of 7,881 lots traded in the market. FKLI rebound during 2nd trading session as regional indices and Dow Jones futures electronic trading traded firm during the trading session. 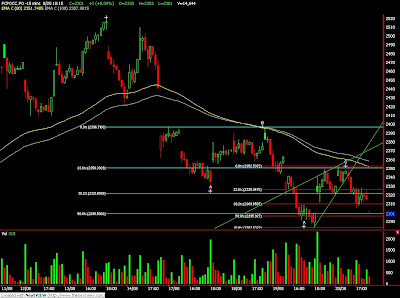 Technically, FKLI seems temporary supported above 23.6% Fibonacci retrace levels at 1157 while island reversal pattern seems formed in hourly chart. Based on our technical analyst, our opinion suggests FKLI would encounter some selling pressure around resistance levels at 1166 and 1178 regions. 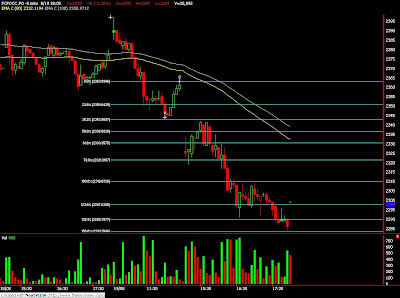 Traders were advice to hold short position cautious ensure resistance levels were not violated. 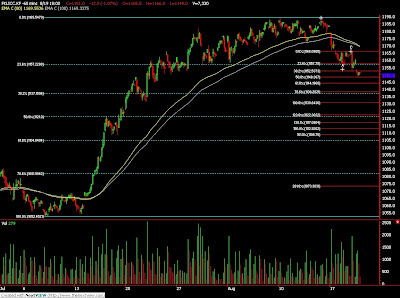 Support levels were seen at 1157 and 1145 levels. CPO 3rd month Oct futures contract rebound RM40 points higher as compare to previous trading sessions to close at RM2375 with a total of 8,652 lots traded in the market. CPO price were traded sideways during trading session as lack of market leads after huge movement from previous trading sessions. 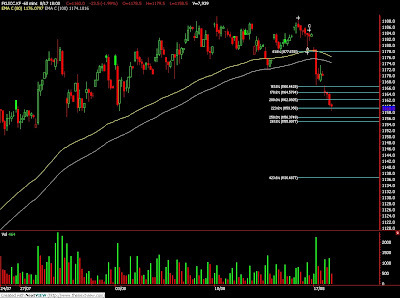 Technically, CPO consolidates within range from RM2360 to RM2380 during trading session. Based on our technical interpretation, our opinion suggests CPO price possible to test resistance levels at RM2400 and RM2440 regions. However, traders were advice to hold short position in the coming trading session provided resistance levels were not violated. Support were seen at RM2355 and RM2300. Aug. 18 (Bloomberg) -- Crude oil rose, snapping two days of losses, as the dollar fell against the euro, spurring investors to purchases commodities denominated in the U.S. currency. Crude oil for September delivery rose as much as 63 cents, or 0.9 percent to $67.38 a barrel in after-hours electronic trading on the New York Mercantile Exchange. It was at $67.32 a barrel at 8:29 a.m. Singapore time. Yesterday, it fell 76 cents to $66.75, the lowest settlement since July 29. Aug. 17 (Bloomberg) -- Gold fell the most in two weeks as the dollar rallied, curbing bullion’s appeal as an alternative investment. Silver posted the biggest slide in two months. The dollar rose for the second straight sessions against a basket of six major currencies. Global equities tumbled on concern that the economic recovery will sputter, increasing the allure of the greenback as a haven. Gold’s decline “is all on the back of the dollar,” said Walter de Wet, an analyst at Standard Bank Ltd. in London. An extended rally by the dollar will drag gold lower, he said. Gold futures for December delivery slipped $12.90, or 1.4 percent, to $935.80 an ounce on the Comex division of the New York Mercantile Exchange, the biggest drop since July 28. Earlier, the metal touched $931.30, the lowest for a most-active contract since July 30. Silver futures for September delivery slid 74.7 cents, or 5.1 percent, to $13.975 an ounce, the sharpest decline since June 15. Earlier, the price touched $13.82, the lowest level this month. Gold for immediate delivery fell $14.45, or 1.5 percent, to $934.10 an ounce at 4:20 p.m. in New York. “Gold’s inability to hold $944 support in the face of a firmer dollar projects a move back down to $925,” Ralph Preston, a Heritage West Futures Inc. analyst in San Diego, said in an e-mail. Spot prices have fallen 4.2 percent since reaching a two- month high of $971.68 on Aug. 6. “We continue to see the metal holding ground in a broad range between $920 to $965 over the next few weeks with the metal tracking both the dollar and risk sentiment,” James Moore, an analyst at TheBullionDesk.com in London, said in a report. Crude-oil futures, used by some investors as an inflation gauge, slumped as much as 3.4 percent. Gold is often purchased as a hedge against accelerating consumer prices. Hedge-fund managers and other large speculators reduced their net-long position in New York gold futures by 1.8 percent in the week ended Aug. 11, according to U.S. Commodity Futures Trading Commission data. Speculative long positions, or bets prices will rise, outnumbered short positions by 190,086 contracts on Comex. “Even though longer-term investment demand seems to have dried up for the time being, short-term speculative interest remains positive,” Suki Cooper, an analyst at Barclays Capital in London, said in a report. Thirteen of 27 traders, investors and analysts surveyed by Bloomberg, or 48 percent, said bullion would gain this week. Six forecast lower prices and eight were neutral. Platinum futures for October delivery fell 3.1 percent to $1,222.60 an ounce on the Nymex. Palladium futures for September delivery dropped 3.6 percent to $267.40 an ounce. Aug. 17 (Bloomberg) -- The pound fell the most in more than two months against the dollar after a report showed U.K. home sellers lowered asking prices in August by the biggest amount this year, signaling the recession may have some way to run. The British currency also slid the most in a month against the Japanese yen as Rightmove Plc, the owner of the U.K.’s largest residential property Web site, said the average cost of a home fell 2.2 percent in August after gaining 0.6 percent in July. Stocks around the world dropped after a report showing Japan’s economy grew less than economists estimated prompted investors to shun higher-yielding currencies. The pound fell as much as 1.6 percent to $1.6276, the biggest drop since June 3, before trading at $1.6333 as of 6:10 p.m. in London. It weakened 0.4 percent to 86.19 pence per euro and 1.9 percent to 154.14 yen. The pound’s biggest five-month rally in 24 years may be ending as the Bank of England floods the shrinking U.K. economy with newly printed cash and slowing inflation precludes higher interest rates to lure investors. The currency soared 23.5 percent from March 10 to Aug. 5 on speculation U.K. assets would rise as the worst financial crisis in six decades eased. The sharpest increase since 1985 ended Aug. 6 after policy makers said the recession was deeper than anticipated and moved to spur the economy by expanding its purchases of U.K. debt 40 percent to $290 billion. Six days later, central bank Governor Mervyn King said inflation will probably fall below the Bank of England’s target. The pound slumped 2.6 percent since Aug. 5 to last week’s $1.6543 close. Only three of 176 currencies tracked by Bloomberg did worse. After the Bank of England decision, pound futures and options speculators became more pessimistic as weekly bets favoring sterling fell more than 32 percent, the most since November. The British currency may rise to $1.75 this year as evidence grows that the global economic recovery is gathering strength and riskier assets rally, said Stephen Jen, a money manager at BlueGold Capital Management LLP. U.K. two-year government notes rose for a sixth straight day, the longest streak of gains since the seven days ending April 30, pushing the yield down as much as 7 basis points to 0.86 percent, the lowest level since at least 1992, before trading down less than 1 basis point at 0.90 percent. The 4.25 percent security due March 2011 was priced at 105.17. The 10- year gilt yield fell 7 basis points to 3.60 percent, the lowest level since May 20 based on closing prices. Gilts returned investors 2.5 percent this month, compared with a zero return on U.S. Treasuries and a 0.05 percent loss for German government bonds, according to Merrill Lynch & Co. indexes. Gilts will keep rising as the U.K.’s struggling economy and the Bank of England’s bond-purchase program buoys demand, Carl B. Weinberg, chief economist at High Frequency in Valhalla, New York, wrote in a report today. “With the BOE still buying gilts, and with the consumer price index tame for a few months -- and with the economy deeply depressed -- we expect the yield curve to flatten more as bond yields rally more than interest rates,” Weinberg said. King said on Aug. 12 the world remains in “deep recession” and that banks may need to raise more capital to rebuild their balance sheets. Policy makers this month voted to add 50 billion pounds of newly printed money to its bond-buying program to ease Britain’s recovery. The central bank bought 1.4 billion pounds of gilts maturing between 2025 and 2032 today, and plans to purchase the same amount again on Aug. 18 and Aug. 19, bringing the total to 130.8 billion pounds. The U.K. will show economic growth again in the second half, Bank of England policy maker Andrew Sentance wrote in an article for the Sunday Times newspaper yesterday. “I expect to see a return to growth in the second half of this year, as the U.K. economy responds to the stimulus from low interest rates, a competitive exchange rate, government tax and spending measures, an improving global economic environment and the Bank’s policy of quantitative easing,” the newspaper quoted him as saying. The U.K.’s Debt Management Office will hold quarterly meetings today with investors and gilt-edged market makers, which are obliged to bid at U.K. government bond auctions, to discuss the issuance outlook for the fourth quarter. The results of the meetings will be announced at 9 a.m. in London tomorrow, according to the debt office’s Web site. FKLI Aug Futures contract plunge 23.5 points lower to close at 1160 levels as compare to previous trading session to with a total of 7,939 lots traded in the market. FKLI was traded lower as regional indices especially Shang Hai and Hang Seng indices plunge during trading hours. Technically, FKLI plunge during trading session as manage to breach previous support levels at 1178 and 1172 from consolidation regions. Based on our technical analyst, our opinion suggests FKLI possible to rebound after met target 1159.5 levels at 223.6% Fibonacci projection. However, traders were still advice to hold short position in the coming trading session while be cautious around resistance levels at 1175 and 1168.5. Support levels were seen at 1154 and 1140 levels. CPO 3rd month Oct futures contract plunge RM102 points lower as compare to previous trading sessions to close at RM2335 with a total of 12,582 lots traded in the market. CPO price were traded weak as crude oil and soybean oil were traded plunge during trading session. Technically, CPO plunge after breach previous support levels at RM2424 but temporary holding above 80 – day and 100 – day exponential moving average in the 15 min price chart. Based on our technical analyst, our opinion suggests CPO price is possible to rebound in the coming trading session after met projection at RM2335, 178.6% Fibonacci projection. However, traders were advice to hold short position for trend trading provided resistance levels at RM2440 and RM2470 were not violated while be alert around support levels at RM2300 and RM2250 regions. Aug. 17 (Bloomberg) -- Crude oil traded near a two-week low on speculation declining seasonal demand in the U.S. and rising stockpiles will ensure adequate supplies during the North Atlantic hurricane season. Oil fell 4.8 percent last week after an unexpected decline in U.S. consumer confidence and reports showing refining and gasoline demand at their lowest in more than 12 weeks. Tropical Storm Claudette, the first to make landfall in the U.S. this season, may strengthen as it approaches western Florida’s gulf coast, the National Hurricane Center said. High stockpiles mean “the supply-risk premiums coming out of the hurricane season will be relatively mild,” said Toby Hassall, analyst at Commodity Warrants Australia Pty in Sydney. Investors are “not going to be quite as jittery given we don’t have that demand-supply tightness” of previous years, he said. Crude oil for September delivery was at $67.45 a barrel, down 6 cents, in after-hours electronic trading on the New York Mercantile Exchange at 7:33 a.m. in Singapore. The contract fell $3.01 to $67.51 on Aug. 14, the lowest settlement since July 30, after the Reuters/University of Michigan preliminary index of consumer sentiment fell to a five- month low, equities dropped and the dollar gained against the euro, reducing the appeal of commodities. Oil climbed to an eight-month high of $73.38 on June 30. Crude oil inventories in the U.S., the world’s largest energy consumer, rose the past three weeks as refiners reduced gasoline production with the end of the summer driving season. Distillate stockpiles, which include diesel and heating oil, are near their highest in 25 years. Rigs and platforms in the northern Gulf of Mexico accounted for about 23 percent of U.S. oil production last year, according to Energy Department data. Hurricane Ike last September shut almost all the region’s oil production and about 20 percent of the nation’s refining capacity. Hurricanes Katrina and Rita, which struck the region in 2005, killed more than 1,800 and did more than $71.3 billion of damage. Tropical Storm Claudette, with winds near 50 miles (80 kilometers) an hour, was about 120 miles southeast of Pensacola and approaching the Florida coast at about 14 miles an hour, the Hurricane Center said in an advisory on its Web site. Ana, east of the Leeward Islands, has weakened to a tropical depression, the center said. Tropical Storm Bill in the mid-Atlantic may strengthen to a hurricane as it heads northwest in the next 24 hours, the center said. Brent crude oil for October settlement fell 8 cents, or 0.1 percent, to $71.36 a barrel on London’s ICE Futures Europe exchange. It dropped 3.4 percent to $71.44 on Aug.14. Hedge-fund managers and other large speculators reduced their bets on rising New York oil futures last week, according to U.S. Commodity Futures Trading Commission data. Speculative net-long positions, the difference between orders to buy and sell the commodity, fell 21 percent to 27,077 contracts in the week ended Aug. 11, the commission said. Aug. 17 (Bloomberg) -- The yen rose to a two-week high against the euro after a government report showed Japan’s economy grew last quarter as a global rebound helped the country climb out of its worst postwar recession. Japan’s currency advanced against all 16 major counterparts after the report showed the world’s second-largest economy grew for the first time in more than a year on a rebound in exports and consumer spending. The euro also slid against the yen for a second day after Asian stocks extended a drop in global equities, damping demand for higher-yielding assets. Japan’s currency rose to 133.90 per euro, the highest since July 30, as of 9:09 a.m. in Tokyo from 134.84 in New York on Aug. 14. The euro dropped to $1.4157 from $1.4203. The yen gained to 94.61 per dollar from 94.94. The MSCI Asia Pacific Index of regional shares declined 0.9 percent, halting a two-day gain. “We suspect some easing in risk appetite will help support safe-haven currencies like the yen,” said Danica Hampton, a currency strategist at Bank of New Zealand Ltd. in Wellington. Japan’s gross domestic product expanded an annualized 3.7 percent in the second quarter, following a record drop of 14.2 percent in the three months ended March 31, the Cabinet Office reported in Tokyo today. That compared with a 3.9 percent rise forecast by analysts surveyed by Bloomberg News.